Background: Hepatitis C Virus (HCV) is a major cause of chronic liver disease in the world. Many studies showed that T-cell responses to HCV Nonstructural Protein 3 (NS3) play an important role in clearing acute HCV infections, thus NS3 can be considered as a suitable candidate antigen for development of a HCV therapeutic vaccine. Objective: We used Hp91 peptide and small heat shock protein 20 as an adjuvant for enhancement of NS3-specific humoral and cellular immunity in mice. Method: In this study, various NS3 DNA and protein constructs were generated in eukaryotic and prokaryotic expression systems, and their potency in eliciting humoral and cellular immune responses was compared using small Heat shock protein 20 (Hsp20), the High Mobility Group Box 1 protein (HMGB1)-derived peptide (Hp91), and Freund’s adjuvant in a BALB/c mouse model. Results: Our results indicated that both the Hsp20 conjugated with NS3 protein and Hp91 significantly enhanced the levels of IgG2a, IgG2b and IFN-γ directed toward Th1 responses compared to other groups. Moreover, the immunostimulatory properties of Hp91 were significantly higher than Hsp20 and Freund’s adjuvant in various immunization strategies. 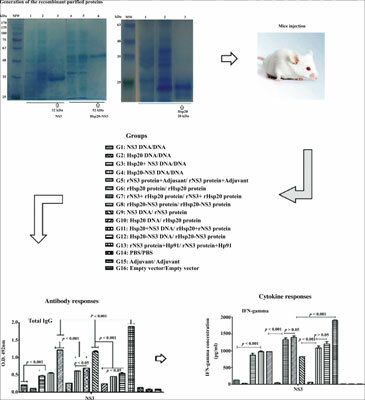 Mice immunized by NS3 protein formulated with Freund’s adjuvant, and also mixed with Hp91 peptide showed higher secretion of Granzyme B than other groups. Conclusion: Hp91 peptide could develop NS3-specific B- and T-cell immune responses as a promising HCV therapeutic vaccine candidate in future. Hepatitis C, therapeutic vaccine, nonstructural protein 3, adjuvant, heat shock protein 20, Hp91 peptide.